• Brink and Reckermann won four of their first six events together as partners in 2009, including the World Championships, but then did not win again until the 2012 London Olympics, going 26 events without a title. • In the first five titles won by Brink and Reckermann, the opponent was from Brazil each time. • Brink's first career semifinal on the FIVB Tour came in the 2005 World Championships in Berlin, where he and Kjell Schneider won a Bronze Medal in their home country. • Brink's first FIVB Tour Gold Medal, in Portugal in 2005, came against two players he had partnered with once prior; Markus Dieckmann (his partner in his first FIVB Tour event) and Jonas Reckermann (a one-time CEV partner). 2012: Brink played one tournament with Sebastian Fuchs, placing 17th. Brink and Reckermann advanced to two semifinals in five events, winning their only medal in the London Olympics as they won the Gold. They ended the season as the 25th-ranked team on the tour, behind three other teams from Germany. They won their only CEV event, the European Championship Final. 2011: Brink and Reckermann won seven medals in 10 FIVB events, with a best of second three times. In the World Championships in Rome the duo won the Bronze Medal. They ended the season as the third-ranked team on the tour. They won their only CEV event, the European Championship Final. 2010: Brink and Reckermann advanced to six semifinals in eight FIVB tournaments, with a best of second twice. They played in just one CEV event, the European Championship Final in Berlin, and finished ninth. 2009: Brink began playing with Reckermann for the first time on the FIVB Tour, advancing to the semifinals in nine of the 10 events. Their second title together came in the World Championships in Stavanger, and was followed up with a pair of Grand Slam Gold Medals. During that span they set the FIVB Tour record for most consecutive match victories with 25. Brink and Reckermann won the tour's points championships, becoming just the second European team to accomplish that feat. On the CEV Tour they won one event and three additional medals before placing fourth in the European Championship Final. 2008: Brink and Dieckmann advanced to seven semifinals in 12 FIVB events. After two second-place finishes the duo won in Spain. In the Beijing Olympics the duo placed 19th. They ended the season as the second-ranked team on the FIVB Tour. Brink and Dieckmann placed third in a CEV event before getting a fourth-place finish in the European Championship. 2007: Brink and Dieckmann played in 12 FIVB Tour events, with a best of fourth three times. The duo was 17th in the World Championships in Gstaad. On the CEV Tour they won their first two events before finishing ninth in the European Championship. 2006: Brink began a partnership with Christoph Dieckmann, and they won medals in each of their first three FIVB events, including a win in Portugal. On the year they played in nine events with the lowest finish being fifth. The duo ended their season with a win in Brazil after back-to-back match wins against two Brazilian teams in reaching the Gold Medal match. They ranked third in the points championship. On the CEV Tour the duo had a third-place finish followed by three wins, including the European Championship Final. 2005: Brink and Schneider played in nine FIVB Tour events. They placed third in the World Championships in Berlin, then the next month won in Portugal, giving Brink his first career title. The duo placed ninth in all three of their CEV evens, including the the European Championship Final. 2004: Brink continued playing with Schneider, advancing from nine qualifiers with a best of seventh. The duo lost one country quota and twice was seeded directly into the main draw. The pair played in three CEV events, including a 17th in the European Championship Final. 2003: Brink and Schneider played in nine FIVB Tour events. They lost in the country quota three times, in the qualifier three times, and advanced to three main draws with a best of ninth. Brink and Jonas Reckermann competed in one CEV event, placing fifth. Brink and Schneider finished fifth in the CEV European Championships. 2002: Brink started a new partnership with Kjell Schneider, and the duo advanced to the main draw twice from four qualifiers, with a best of ninth. 2001: Brink played alongside Rudiger Strosik, competing in four qualifiers but no main draws. The duo also placed fourth in the CEV U23 European Championships. 2000: Brink and Niklas Rademacher finished third in the CEV U20 European Championships. 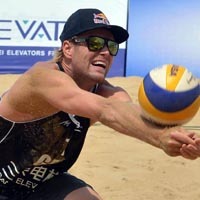 At age 18 Brink competed in his first FIVB Tour event, placing ninth with Markus Dieckmann. • In the 2012 London Olympics Brink qualified with Jonas Reckermann as the third seed. The duo went 3-0 in pool play, then 4-0 in bracket play in winning the Gold Medal, defeating Brazil's Alison Cerutti and Emanuel Rego in three sets. • In the 2008 Beijing Olympics Brink qualified with Christoph Dieckmann as the sixth seed. The duo went 1-2 in pool play, finishing 19th. Personal: Brink is the son of Dr. Klaus Brink (chemistry) and Ruth Brink (nurse). He has two brothers (Benjamin and Florian). Best description of himself, off-the-sand - Open. Best description of himself, on-the-sand - Aggressive and sometimes freaky. People who have helped him most in life - His Mom, friends and family.